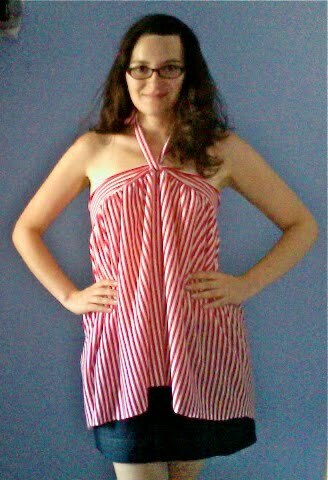 A couple weeks ago I saw a bolt of stretch knit, red and white striped fabric at a flea market for $7.99 and bought it. Since then I've been staring at it trying to figure out what to do with it. Today I was determined to make at least one project out of it. I decided to make a quick little simple skirt. 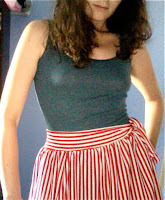 I cut a waist band by just cutting a long strip of fabric and tying it around my waist. I marked where I tied it on each side of the bow so that I'd know how must material I needed left to be able to tie it on my hip. I also cut out two big rectangles the length I wanted my skirt to be and the width of my waist so each was big enough to go around me by themselves. I wanted a full skirt so I sewed these together on both sides making a large tube. 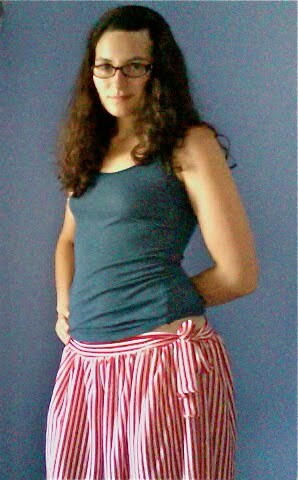 I gathered up the top and sewed it to the waist band, leaving the ends of the waist band loose so that I could tie them. I had to stretch the waist band as I sewed it. 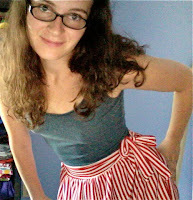 The finished skirt took less than 30 minutes to make (although I still haven't hemmed the bottom). I like it best as a high-waisted skirt tied on the side. (For me, my natural waist counts as high-waisted since I usually wear everything on my hips!) I realized later that the skirt is quite versatile. It works as a comfy summery top if you put the ties in the center above your bust and tie it behind your neck. I was surprised at how much I liked it that way since I never intended this to be a top. I also like it lower on my hips although it isn't as flattering!